There is an acute and increasing capacity shortage in the UK power market. The UK capacity market was implemented to address this problem in 2014 but has instead contributed to it. As a result the UK is increasingly falling back on a temporary emergency reserve mechanism to prop up UK security of supply. There is an acute and increasing capacity shortage in the UK power market caused by the retirement of older gas and coal plants. This is being driven by ongoing weakness in thermal generation margins, due in part to increasing volumes of renewable output. In response to security of supply concerns, the UK government introduced a capacity market in 2014. The aim of this intervention was to provide a reliable stream of income to support the flexible thermal capacity required to backup intermittent renewable output. But so far the capacity market has had the opposite effect. Low capacity prices have contributed to the closure of existing thermal plants. At the same time the capacity market has incentivised delivery of very little in the way of new capacity. So the UK’s system reserve margin, rather than stabilising, continues to fall. Security of supply is instead being maintained by a stop gap secondary ‘market’ for capacity known as Supplemental Balancing Reserve (SBR). SBR was designed as a temporary measure for the system operator to acquire emergency reserve while the government implemented a real capacity market. But SBR is increasingly becoming the real UK capacity market, by default rather than design. In the client briefing pack we published before the 2nd auction, we set out our expectations for the price to clear in the 10-15 £/kW range. We also set out a 20 £/kW upper bound driven by CCGT fixed costs and 5 £/kW lower bound driven by the risk adjusted value of waiting to the T-1 auction. The auction cleared at 18 £/kW towards our upper bound (as shown in Chart 1), driven by the bidding behaviour of older CCGTs. This was marginally below the 2014 auction but broadly in line with market expectations. 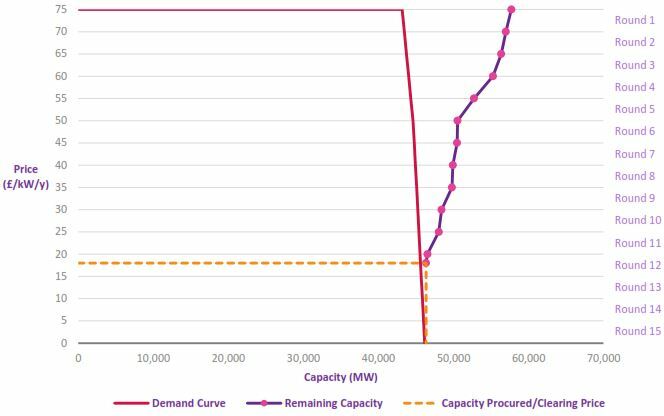 5.1 GW of older existing capacity was unsuccessful in getting capacity agreements. This consisted of 2GW CCGT and 3.1 GW coal plants. In many ways this is the most important outcome of the auction. Without capacity payments, the economics of these older plants is unviable, in the absence of other regulatory support. Genuine new build capacity consisted of 1.1 GW of smaller scale peakers, with 0.5GW of DSR. A significant volume of this was in the form of diesel generator sets, causing the government some embarrassment from an emissions perspective. The 810MW Carrington CCGT was also successful in bidding for a one year ‘new build’ agreement, although this plant was only new build in a technical sense, given it is already close to completion. A relatively high volume of capacity (around 8GW) exited the auction above 50 £/kW as can be seen in Chart 1. This included the larger scale new build CCGT projects in an indication that under the current market rules, the capacity price will need to rise significantly to incentivise CCGT new build. The new UK-Belgium NEMO Link interconnector project also failed to secure an agreement. This was unexpected given that the link will presumably be developed anyway given healthy economics & other regulatory support. In summary there were no real surprises from the auction outcome. Much more interesting will be what happens to the 5GW of existing plants that exited the auction. This capacity joins a growing list of older coal and CCGT plants that are queueing up for life support from the SBR mechanism. In 2015 around 5GW of capacity announced its intention to close, after failing to secure a capacity agreement in the first auction. Another 5GW of capacity has now been added to the endangered list after the second auction. That leaves a cloud of uncertainty hanging over security of supply in the UK power market. The UK cannot afford to lose 10GW of capacity. This would send the system reserve margin deep into negative territory. Neither the capacity nor the energy market is currently incentivising older flexible plants to remain open. This is where the UK’s unofficial secondary capacity market comes in. The results of National Grid’s procurement of SBR capacity for Winter 2016-17 were released just before the T-4 capacity auction. These show Grid paying an average of 34 £/kW for 3.6GW of capacity, close to double the clearing price in the last two T-4 capacity auctions. In fact one large unit (500MW+) appears to have been paid an 88 £/kW capability price (higher than the price cap of the T-4 auction). In addition to these costs, Grid must also pay utilisation fees if the units are called on to run. Can the status quo really continue? A cynic could be forgiven for questioning the logic of these dual capacity markets. The main T-4 capacity auctions have been incentivising capacity to close, given clearing price levels below the fixed costs of thermal assets. But at the same time, the SBR mechanism is paying a substantial premium to ensure that the same plants remain open once they have failed to secure an agreement in the T-4 auction. The inconsistencies and distortions that have plagued the UK power market since the implementation of the Electricity Market Reform (EMR) policies continue. The UK government seems to be wandering along an expensive path towards an increasingly centrally planned capacity mix. There has to be a smarter way to run a power market! We suspect that the fallout from the 2015 capacity auction and SBR procurement will cause the government to step in with further policy interventions in 2016. We will come back shortly with our thoughts on how this may impact the UK power market going forward. But the winners from a changing rule book are likely to be the developers of larger CCGT assets, with the losers likely to be high emissions diesel and coal generators.